TuneIn announced an effort to connect its listeners with live music events. The audio company is planning to launch stations focused on different music festivals. The effort will include the Hangout Music Fest, Movement Detroit on Red Bull Radio, Firefly Music Festival, Newport Folk Festival, Outside Lands Music and Arts Festival, and Bumbershoot Music and Arts Festival. All of these stations will be housed in the new TuneIn Festival VIP channel. The stations for each of these events will feature music from artists slated to perform at those festivals. They will have human-curated programming. While the event is happening, the station will also live-stream select performances, interviews, and exclusive content. 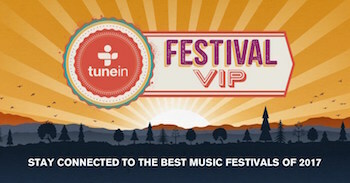 “Live music is the heartbeat of every music fan, so it’s exciting for us to use our platform to amplify music festival experiences and offer exclusive artist sets and content to millions of monthly listeners throughout the summer,” said Charles Raggio, TuneIn’s senior director of music partnerships and branded content.